Crowdsourcing the application of science? New website from English PhD students aims to focus the power of the internet to find applications for scientific research. Making the leap from innovation in the lab to commercially viable product doesn’t – as we’ve seen in our recent interview series on entrepreneurs in science – always go exactly to plan. Sometimes a good idea just doesn’t have an obvious application, at least to the inventors, and thus much research that might have been commercialised never is. That’s where a new website called Marblar might come in. Founded by a team of life science PhD students from London and Oxford, it aims to tap the global community of scientists, engineers, and designers – in fact, anyone with a bright idea – to match research produced by active academics to potential commercial applications. Leeds researchers hope that Marblar will find an application for their high-temperature piezoelectrics. 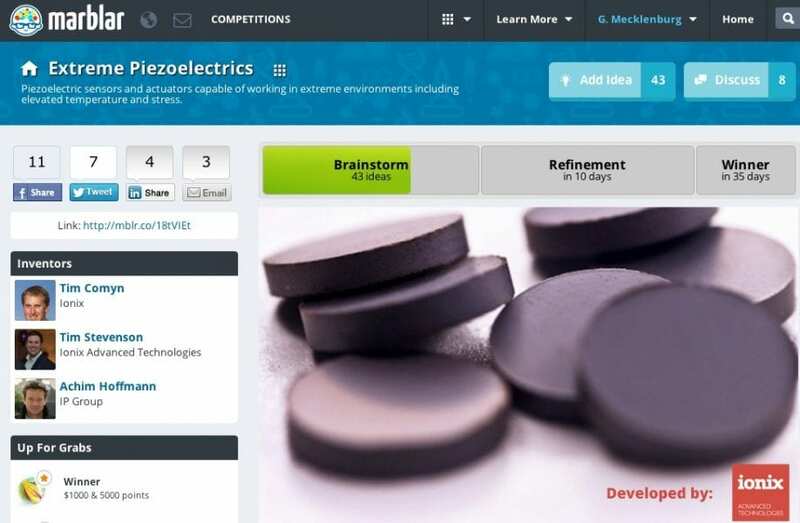 For example, a University of Leeds team have submitted their highly temperature-resistance piezoelectrics for consideration. With just under two weeks to run, some of the leading applications for this technology (as suggested and voted by the community) are the development of sonotrodes for hot steel cutting, combustion engine stress sensing, and direct measurement of blood pressure from inside an artery. 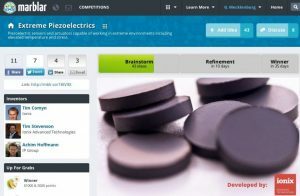 While that last one might not seem immediately related to the temperature resistance of the piezoelectric devices, the submitter points out that heat is a primary method of sterilising medical equipment, and that this is particularly important for implants. The three co-founders of the site – Daniel Perez, from Oxford University, Mehmet Fidanboylu, King’s College London, and Gabriel Mecklenburg, Imperial College London – saw first-hand through the course of their work how this kind of exciting research often never makes it into the marketplace, or even into use beyond niche scientific applications. Marblar is their solution. Their goal is to build a large, skilled community with as many disciplines as possible represented, meaning someone, somewhere will always have a good idea for a specific piece of research. This community seems quite active – the Marblar team claim almost 10,000 total registrants – and also of a high quality not often seen on the internet. The member topping the marble leaderboard – “marbles” are the mark of achievement awarded through the voting process on the site, hence the name – describes himself as a technology developer at a Canadian biotech company, and moving down the list you see medical students, professional designers and product developers, engineers, and researchers. One of their past successes involves the repurposing of a spectroscope designed by the European Space Agency to composition analysis for exploratory oil drilling – as a result of suggestions given by the Marblars, Shell is now in talks with the inventors. An interesting addition to the crowdsourcing model is the awarding of a cash prize – funded by the research team presenting the work, and usually in the region of $1,000. The site creators decided to include this as a means of making the competition for each invention feel more meaningful – although their users seem to be more interested in the prestige of collecting virtual marbles, they reason that a real prize at the end of the process helps to focus minds. Each project goes through a six week process of brainstorming and refinement – with users able to build on each other’s’ ideas – and marbles are awarded based on votes from the user base, with the final winner decided by the inventors. This site feels like something of a first for science – an online community designed to allow knowledge sharing across any discipline (or even none), while aiming to solve specific problems and bring scientific research to the rest of the world (and cash to the inventors). It’s worth keeping an eye on, and, if you’re so inclined, collecting some marbles – I’ll be very interested to see how it develops. This article was updated at 11:28 on July 12th 2013 to correct Gabriel Mecklenburg’s affiliation.